The Last Day – How Would You Do It? Hello! 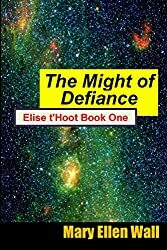 I thought I might share a chapter from The Might of Defiance. Today 7/14/17 is the last day it’s free; don’t miss it! At the first glimpse of dawn’s rays, Cedric came to the Ag bench to find complete disarray and nobody present. He wanted to get an early start with his investigation of the crash site and came to ask San Luis along to spite the Commander. The whole cabal of them was missing from the Portico, but those odd trees were blocking his way to check the pod; the door stood ajar but he saw no sign of movement. Did they bunk in there last night? He scanned the tree line, unwilling to wander around in there on foot on the chance of finding someone. Without Marta or anyone, the tree things worried him; he couldn’t shake the idea they knew he’d spoken out against them. It took Cedric a second to separate the voices in his head from an external one, to realize a soft, treble voice spoke. “What?” He shifted to find the speaker, but had trouble picking him out from the shadows of stacked equipment and materials. “Tomlinson? Confounded? I surely am, but I am unclear of your interest in it.” He crouched to see the man eye to eye, but regretted it as he thought about how to stand up again. “You don’t believe that rot about some of the trees being aliens? Come on, man, there are some freaky trees that will be cleared off with the rest. Period.” He looked nervously over to the trees that seemed more unsettling in the growing light, seeming to stir out of time with the breeze. How did they come to gather around the pod? Thao did not reply, but stared implacably at him at him steadily, silently. The little man remained silent, gazing through the shadow. Thao faded back into the long shadows with Cedric unable to follow by sight or sound. He shuffled around to face the pod and fell forward, palms to pod, so he could walk his hands up the side to stand. Then the pod door at the end opened wider and the tree-things parted for San Luis to pass. “Hello, San Luis, have you seen Marta?” The moment he asked that he was vexed for not asking San Luis to join him on the investigation. Cedric stood dumfounded with anger boiling up. “You sonuvabitch, you get out of my way.” He tried to slide between a bench piled with parts and his adversary. Barto picked him up, mashing Cedric’s forearms against his ribs, and threw him bodily against the pod, his back impacting hard and his helmet clanging loud. He slid down and landed hard on the packed sand. Cedric stopped the impulse to brush off and sneered at the staring fools. He pushed his hands out, arm muscles tensed hard as if trying to fend them physically until he got by them; with clenched fists and jaws he marched back to the Portico to get the buggy. He saw the Portico’s comm monitor blinking red ‘incoming’ as he entered and saw Olivia on screen the next second. “They won’t let me back there and they won’t allow me to talk to her.” He worked at keeping his jaw loose enough to talk and concentrated on keeping the purple button down. He released the purple button and turned away.